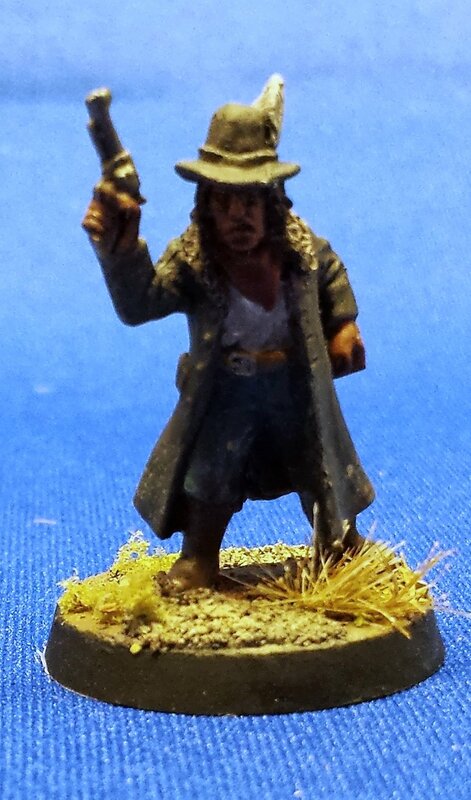 For my wife's birthday this year, I somehow hit upon the idea of giving her a set of miniatures and rules for western role play. Rules were easy, as I went for a hard copy of Go Fer Yer Gun, printed by Lulu. I also managed to get a PDF or the rule book when it was a free item from Drive through Games. This system is based on D&D, and should be pretty easy to pick up. 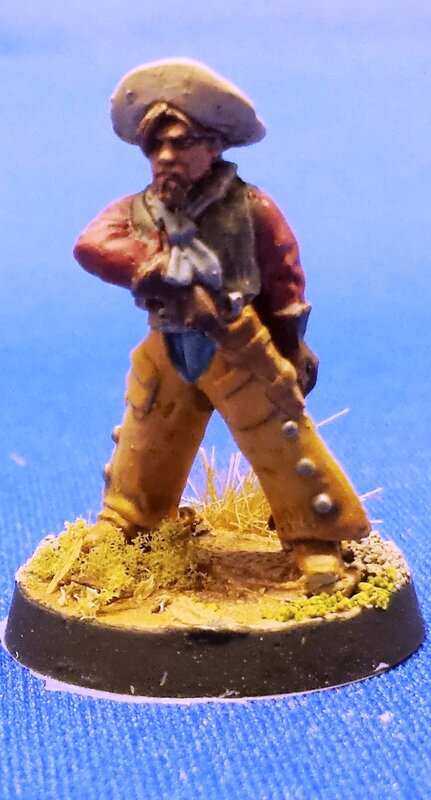 For miniatures, I went with Foundry figures, sculpted by Copplestone (OW9/2, OW11/8, and DA1/6). At $15 a pack, the Foundry figures were a pretty good deal, although the flat rate shipping was a little harsh, particularly considering that it took longer than expected for them to get to me. I was pleased with the sculpts, but there were more mold lines that I was expecting, some of which were too difficult to remove. 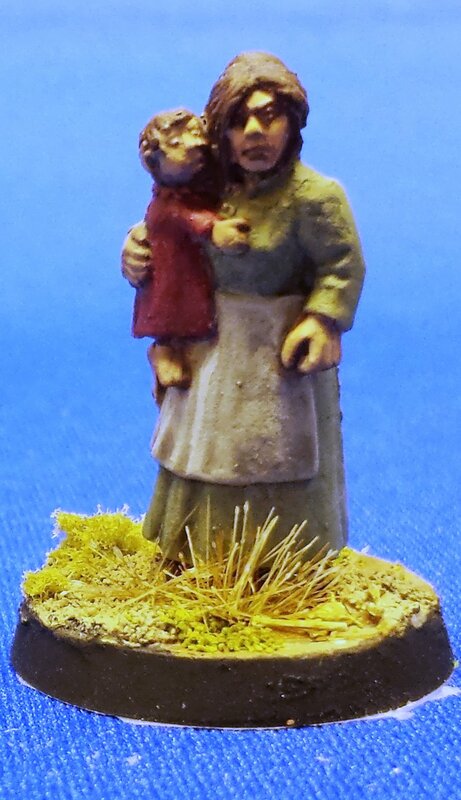 I also painted a random Artisan figure, which had character, but was less technically accomplished than the Copplestones (particularly in the hands). I painted the figures predominantly at work during my lunch hour, and had pretty good success with that. My office gets fairly good light, so it is not too bad for painting. I did run into some technical issues, mostly having to do with the Citadel screw top paints having dried up. My flesh wash was a solid mass, and the propellant from my DullCote had long since vanished, necessitating a trip to the hobby store to procure more. 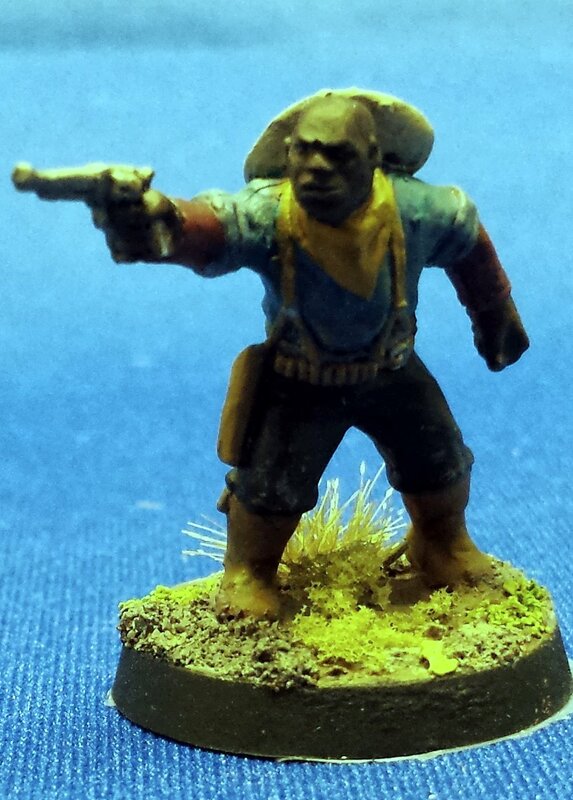 I experimented with some new techniques whilst painting these up, including using a sponge for some of the weathering on the clothes, painting reflections on a bottle, and I used the Perry Miniatures article on Painting Dark African Skin by Steven May to inform my painting of this first fellow. For basing, I tried out grass tufts for the first time, and was somewhat pleased with them. It seems like the particular set of tufts I had were more irregular than clumped, but I think that the overall effect is good (and quick, which its own sort of good). Clearly I need to work on photography, since they are much better "in the hand" than they are showing here. Limited in this case by taking pictures at night with a cellphone. More to come, including a map of Irony City, Montana Territory. The basic box comes with three fighters, the various chits/cards/cardboard to get you started, and then you need to buy booster boxes that have additional fighters and cards. Cards are used to have "upgrades" like famous pilots, torpedoes, extra shields and so on. Currently, you can get most of the fighters from the movies and a few bigger things like shuttles, Slave One, and the Millennium Falcon. LucasArts long ago pre-programed me to be excited by this game, as I put in hundreds of hours playing X-wing, Tie Fighter, and X-wing vs Tie Fighter when I was younger. 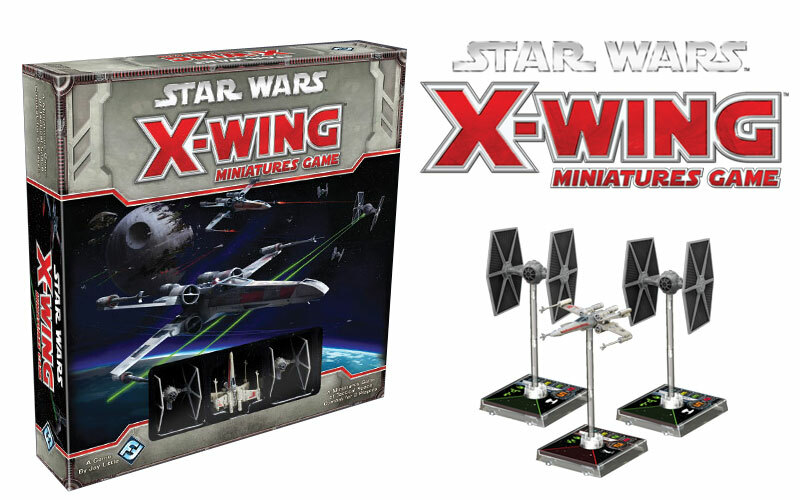 As for actually playing the game, my son squealed "Tie Fighters!" when he saw the box, so apparently he is into it... but he is too small to play it yet. So actual play may have to wait until I can muster up some friends for a couple of duels. As it is that is all I have for now, but if my sources hold true expect more information as it comes! There are some supporting murmurs, TastyTaste is semi-reputable as a rumor monger, and of course some of the Ammobunker crew have been playing Inq28 and similar games with Blanche for a while now, and Blanchistu has featured pretty much only custom war bands... so it could be true. £60/$100 box with ~30 figures. Something like 4 Inquisitors, 8 retinue figures, 8 cultists, 8 guards, one main bad guy, two objective pieces. Inquisitors would be multi-part pushfit, and one would be in power armor, one female. Retinue figures would be archetypes like The Penitent, The Arbiter, the Veteran, the Interrogator, the Daemon, the Fanatic, the Sage, the Mystic, The Harlequin, etc. Cultists would be similar to those in the 6th edition box, but with lasguns, and with more bionics, and would have one special weapon, and one leader. Guards would be something more generic, but otherwise like the cultists, maybe with cyberhounds. Most of the non-inquisitors would be monopose two part pushfit, except the main bad guy, and if there is one, some sort of hulking beast. Another sprue of terrain, which is sort of down-hive versions of the cities of death stuff, made similar to the buildings that came with the LotR boxes, i.e. thin walled, but detailed on both sides. Expect mostly ruined corners, like most terrain for 40k. Game play as basic Necromunda/Mordheim, but with all character stats on large cards. Stats as per current Warhammer 40k, but with movement and willpower. Wargear and one shot weapons on wargear cards that attach to the character cards [grenades, refractor fields, Emperor's tears, etc.]. More cards for terrain effects/defenses, psyker powers, wound effects. Dice in the usual amount, and jam dice for multi-shot guns (Someone at GW clearly loves second edition lately). Inquisitor/Retinue experience is limited to some sort of skill upgrade cards [inquisitors pick, and retinue gets them randomly]. Two books in the box, one of rules, one of missions and character backgrounds. Blanche art throughout, but box cover is painted by someone else. Features in one issue of White Dwarf, mentioned in a second. If they ever do expansions, it would be a sprue of one Inquisitor with two new retinue figures, and accompanying cards. Yeah... I would buy that, and I suspect a lot of you would too. My wife and the newborn were away this weekend visiting relatives, so after a couple long days wrangling a three year old, I managed to get in some hobby time, and stuck together some bitz. Primarily I was able to get this armsman with voidarmor assembled. He is made from a Valkyrie door gunner body, bike scout shotgun arm, chimera head, three separate bitz for his right arm, chaos warrior boarding axe, and some tanks and bitz on the back that can not be seen in this picture. The chest armor and neck ring was made from a bit of plastic tubing that I got at the hobby store. He still needs some detailing and putty work to fill gaps, and add some strapping. You might be able to make out in this reduced picture that I tried the micro beads as rivets technique, which I still need to practice with. 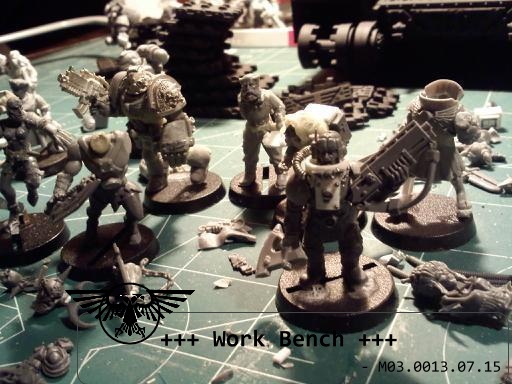 Also visible in various stages of completion: (from left to right) a death cultist with a venom hand, the xenophile, Death Watch marine, pilot, sage, headless inquisitor, and the torso for a female interrogator. Annoyingly my super glue turned to super goo over the weekend, possibly due to a faulty lid design letting in air (or failure to reseal properly! ), which slowed things down a bit. I also finished my secret painting project, which I will reveal in good time.